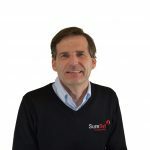 To round up a fantastic 2012 we wanted to have a little interview with the two people who have led SureSet to be what it is today. Meet Peter Watts – Chairman (on left) and Kevin Weston – Managing Director (on right). Both have been leading the company since 1996 and have seen it grow and progress to new levels. We’ve put a few questions to them so that we can all find out a bit more about these two incredible individuals. Q: How did you find yourselves at the forefront of resin bound permeable paving? Kevin: Joined the technical department of a quarry company who took over a company who made a clear tarmac and then working to improve its quality and performance. Eventually coming to the conclusion that resin bound permeable paving was the way forward and given the opportunity by Peter Watts to join SureSet UK Ltd soon after its inception. Peter: In the 1980’s, I was Technical Manager for Foster Yeoman Ltd, a major Quarrying and Asphalt Producer based in Somerset and I found myself responsible for improving the durability of a hot mix clear resin bound asphalt paving system, that they used to produce on their asphalt plant at Dulcote Quarry near Wells. I came up with the idea of replacing the simple thermoplastic resin and oil technology that was then used, with a more sophisticated and durable chemically setting resin system. Upon being made redundant in 1995, I developed this idea into a business plan and SureSet was born in 1996, as a partnership with some friends. In 1997 we formed the Limited Company and our current MD Kevin Weston joined us formally in 1999. Since then, we have built the company up into the market leader for permeable resin bound paving in the UK and I have more or less retired, leaving all the hard work to my wonderful team. Q: What has been your professional highlight of 2012? Kevin: To have been involved, in our small way, in the construction of the 2012 Olympic site. Peter: My highlight of 2012 was to achieve our most profitable year to date. Q: What has been your personal highlight of 2012? Kevin: Long walks (on those few days the sun did shine) through the Lake District this summer. Peter: Singing sea shanties with the Wareham Whalers at the Wessex Folk Festival in Weymouth, at the Falmouth Shanty Festival and at St-Vaast-la-Hougue in Normandy. Not to mention of course the pleasure I’ve got from seeing the SureSet team turn in a bumper profit last year, I really am one very proud Chairman! Q: What are your hopes for SureSet in 2013? Kevin: To build on this year’s good performance and meet everyone’s expectations, customers, staff and shareholders alike. Peter: That we can buck the downturn in construction this year and maintain both sales and profit. Both Peter and Kevin would like to thank all of SureSet’s staff, customers, contractors and followers for being involved with SureSet in 2012. We wish you all a Merry Christmas and a Happy New Year!